The sun's circuit among the stars is limited and defined by the tropics. When, in June, he reaches the tropic of Cancer, and attains his greatest northern declination he goes no farther north, but turns and begins to approach the south. He reaches his greatest southern declination in December at the other tropic, which terminates his southern progress, for he there again turns about, and once more journeys toward the north. Upon the integrity of the sun's movement, in this particular, depend all the order and regularity of the seasons. Should the sun not retrograde at the summer solstice, the heat would grow intolerable, and both vegetable and animal existence not only become impossible from that cause, but the melting of the polar snows and ice would produce another deluge. If the sun, on the contrary, turned not back at the winter solstice, eternal winter would reign in all lands north of the equator, and a perpetual glacial era extinguish all life and vegetation. The foregoing cut is without question the most ancient and proper method of exhibiting the emblem of "a circle embor-dered by two parallel lines." The circle, in order to correspond with our modern ideas of the points of the compass, should be turned about so that the two parallel lines would be in a horizontal and not in a perpendicular position. The tropic of Cancer (25) would then be at the north, and the tropic of Capricorn (\)o) at the south, in accordance with our custom of devoting the top of any map or draft to the north and the lower part to the south. The Hebrews, however, and other ancient Oriental nations, when speaking of the four quarters of the heavens, always supposed the spectator to be looking east, toward the rising sun; and in their language "before" meant "east," "behind" "west," the right hand south, and the left north—as, for instance, the Hebrew word kedem means not only before, but also east. The same custom as to the points of the compass prevailed with the Arabians, who called the north shemal, a word meaning at the left. This ancient custom fully accounts for the fact that in this emblem the two lines representing the tropics are placed in a perpendicular and not in a horizontal position. 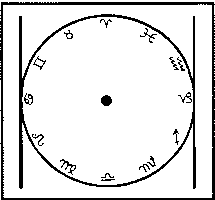 The further fact that in some of the Indian cave-temples the circle is found, actually inscribed with the signs of the zodiac, makes the correctness of the foregoing explanation certain. 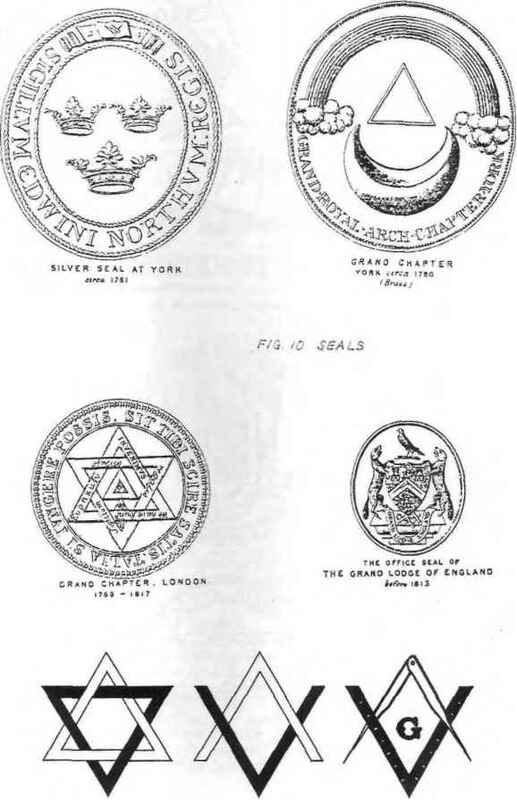 The absurdity of supposing that the operative masons of the middle ages invented this emblem in connection with their art is plain. Q. Of what does this emblem admonish us? A. As the sun, in his annual course around the circle of the ecliptic, perpetually performs his revolution with regularity and certainty, never straying beyond the tropical points, but always returning in due season to beautify, adorn, and fructify the earth, so ought we all to govern our actions with equal certainity and regularity, adorning our lives with wisdom and virtue, and making our years fruitful of good deeds, never suffering our passions to lead us beyond the boundary line of good conduct or the points of reason, for, while we keep ourselves thus circumscribed, it is impossible for us materially to err. Q. To what does the lamb-skin, or white-leather apron, allude? A. The vernal equinox, where the sign Aries is found. This sign, as we have seen, teaches immortality, as well as being emblematic of innocence and beauty. 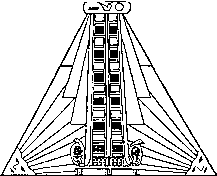 The aprons used in the Mysteries, and by certain sacred officers, were of a triangular form, consisting of two parts, as represented above. In the central part the asps are seen, and in the lower corners are lions' heads. 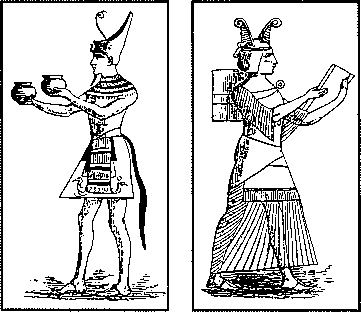 The following drawings are taken from ancient Egyptian monuments. Fig. 1 represents Rameses the Great offering cups of wine in the temple (B.C. 1322). Fig. 2 is the hierogrammat, or sacred scribe. It will be observed that an apron is part of their regalia, each of a different pattern, according to their rank and office. Q. Whence originated the emblem of the all-seeing eye? A. In most of the ancient languages of Asia, "eye" and "sun" are expressed by the same word, and the ancient Egyptians hieroglyphically represented their principal deity, the sun-god Osiris, by the figure of an open eye, emblematic of the sun, by whose light we are enabled to see, and which itself looks down from the midst of heaven, and beholds all things. In like manner masons have emblematically represented the omniscience of the great Architect of the universe.